"If you look at Southwest Airlines, and I admire what they do, they've been the most successful airline in the industry." 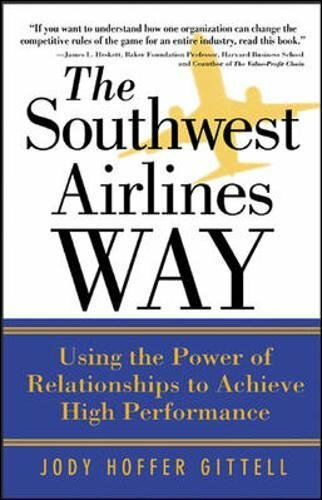 "Through extensive research Jody Hoffer Gittell gets to the bottom of what has sustained Southwest Airlines' positive employee relations and high performance through good and bad times." About: Management lessons from the world's most profitable airline "If you want to understand how one organization can change the competitive rules of the game for an entire industry, read this book. About: "If you look at Southwest Airlines, and I admire what they do, they've been the most successful airline in the industry. About: Real-life case studies and anecdotes highlight a study of the innovative management style of the world's most profitable airline, discussing Southwest Airlines' emphasis on high-performance relationships and people-management practices.